There were over 120 detective old time radio dramas feature men in the lead role and only a handful of women detectives or private eyelashes. The roles for women in traditional detectives dramas are limited to specific archetypes: the innocent victim, the conniving femme fatal, the chatty secretary, and so on. There are colorful names for women including: broad, frail, tomato, skirt, babe, jane, kitten, looker, sister, dame, etc. 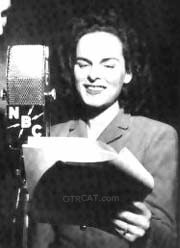 In 1936 the first female detective on old time radio was Phyl Coe, which is a play of the sponsor's name Philco Radio Tube. The show was 15 minutes in length and Phyl Coe shared the solution on the next episode—keeping everyone enthralled. Kitty Keene, the grandma detective and former Ziegfried Follies girl, debuted in 1937 and proved to be a popular show with a four year run. Kitty Keene was co-written by a female writer Day Keene. Carolyn Day is a little known crime show with a female detective lead; its origins are unclear. Meet Miss Sherlock was a summer filler show about a ditzy Jane Sherlock and her attorney boyfriend Peter Blossom. Police Woman debuted in 1946 and was the first radio detective show featuring a female sleuth in a purely dramatic presentation. Lieutenant Mary Sullivan is the title character in Police Woman, which takes place in the New York City Police Department and is sponsored by Carter's Little Liver Pills (a sort of laxative) and Arid Deodorant. In one episode, Lieutenant Sullivan poses as a woman answering a personal ad of a murderer! A west coast version of Police Woman called Police Woman USA takes place in Los Angeles with Sylvia Rollins of the LAPD. Lady in Blue is lady detective old time radio show featuring a beautiful, smart, and rich detective. Monty Masters created Candy Mason and originally wanted a man in the leading role of a San Francisco Detective drama. At the persuasion of his mother-in-law, he reformulated the show and cast his wife Natalie Parks Masters in the lead role. Candy Mason was sassy and levelheaded detective and is an all around entertaining show. The Defense Attorney, staring Mercedes McCambridge, features an attorney named Martha Ellis Bryant who solves crime by "defending the defenseless." The Dame Detectives--Rare Female Crimefighters collection is a diverse collection of crime fighting women of all professions: detectives, police officers, attorneys. Some use their brains, some use their beauty, and some use both to solve crime. For other detective compilations, see also: Hardboiled Detectives, Defective Detectives, Softboiled Detectives, and Detectives Collection. See also: Fatal Females Collection, Wacky Women Collection, . Great compilation of radio shows that I wouldn't have ever known about.